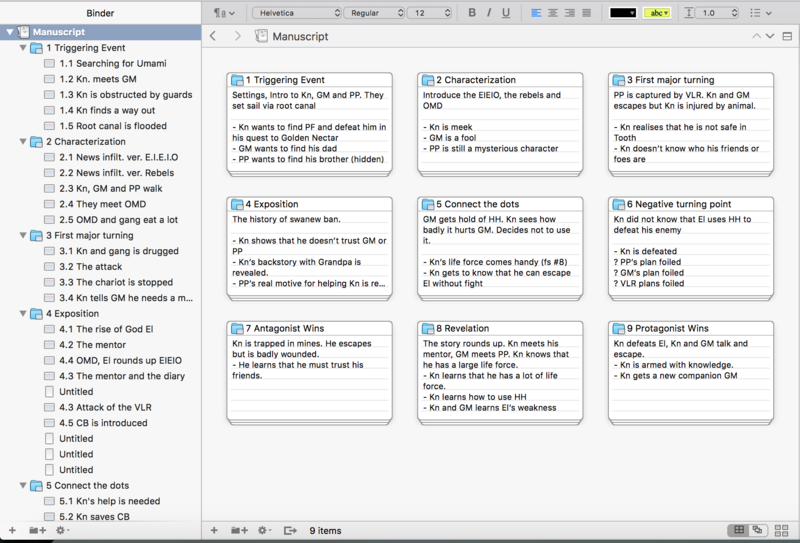 About 10 days ago, I decided to participate in NaNoWriMo 2015. I planned to re-use some interesting characters from my serialisation and weave an entirely new plot. Since 95% of the novel will be spanking new, I have to prepare many things in advance. So far, I have a rough outline and some momentum ready to fuel at least 75% of my run. My world building started with a map and some rough timelines. I drew two rough maps and one detailed map. The detailed map is the place where the events of the entire first volume will occur. 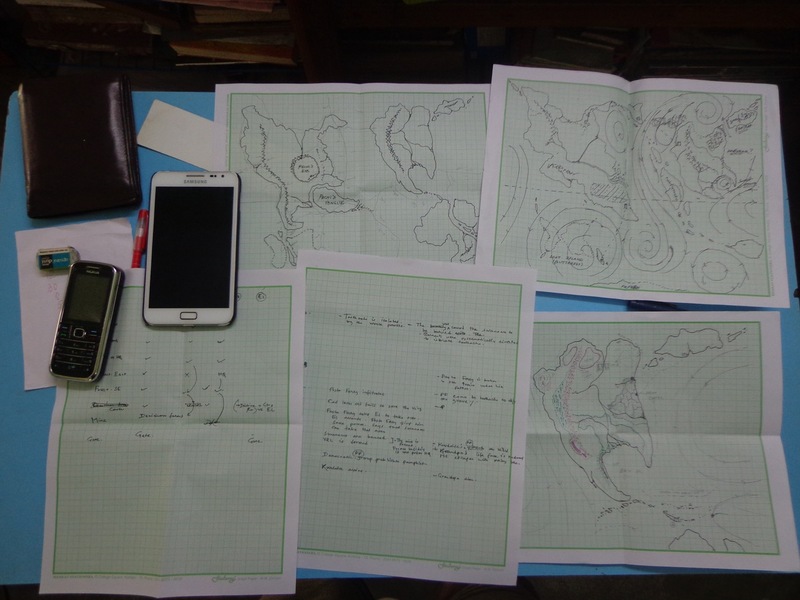 While drawing the maps, I had so many ideas regarding the history of the world. The surprising part was that these ideas were very coherent and made sense within the fictional world. I intend to use them somewhere downstream. The idea behind this approach is borrowed from Holly Lisle. She has quite a few pointers regarding this. I have also received some help from here. I have not named any place yet. Nor have I invented words for certain articles and phenomenon in the universe. Joseph Campbell had written about the hero’s 12 step program. You can read about it here. He had also described the 7 archetypes of the myth. I will not be touching all of them in this volume, but I intend to introduce these characters one by one in the overall series. 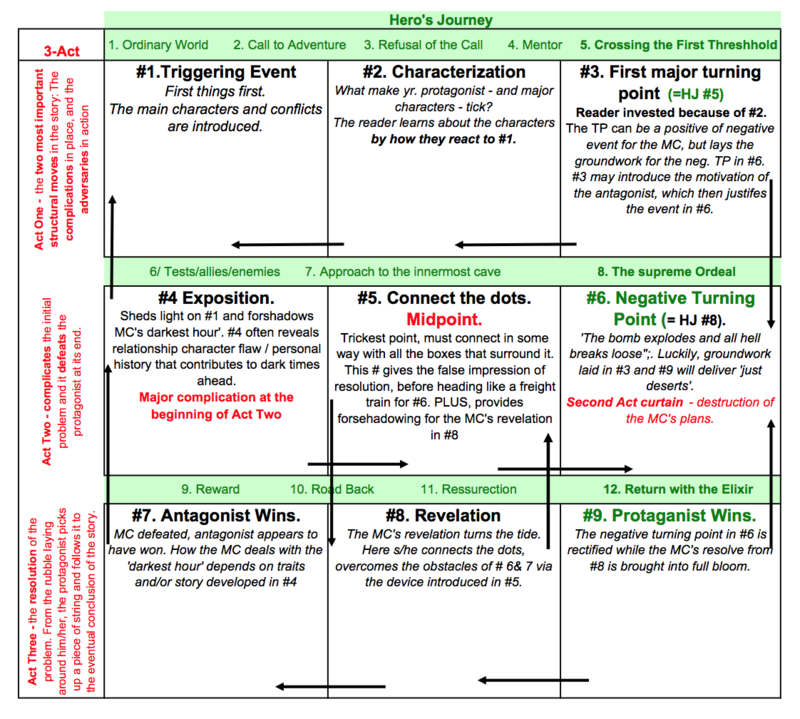 There is a nine block adaptation of the monomyth. It is also called the rubik’s cube method. I have used that to chalk out major events. Monomyth and rubik’s cube blocks superimposed. Long ago, I had also tried using the snowflake method to construct a novel. Although it is an excellent tool, I did not find it suitable for my own use. I am using some basic constructs (especially, the first few steps) and then I will leave the rest to spontaneity. The folders represent each block of the rubik’s cube and the sub pages on the left are scenes. I have stopped planning. I have a solid foundation of the first 25% and the last 25% of the novel. Plotting the middle has been chaotic. Tomorrow the India ML is hosting a meet up in Bangalore. I will not be able to attend. Since I am not on Facebook or Twitter, it is even more difficult to network with fellow participants. I also have the founder, Chris Baty’s book No Plot, No Problem to read before attempting the challenge.